LM331 is basically a precision voltage to frequency converter from National Semiconductors. The IC has a hand full of applications like analog to digital conversion, long term integration, voltage to frequency conversion, frequency to voltage conversion. Wide dynamic range and excellent linearity make the IC well suitable for the applications mentioned above. Here the LM331 is wired as a frequency to voltage converter which converts the input frequency into a proportional voltage which is extremely linear to the input frequency. The frequency to voltage conversion is attained by differentiating the input frequency using capacitor C3 and resistor R7 and feeding the resultant pulse train to the pin6 (threshold) of the IC. The negative going edge of the resultant pulse train at pin6 makes the built-in comparator circuit to trigger the timer circuit. At any instant, the current flowing out of the current output pin (pin 6) will be proportional to the input frequency and value of the timing components (R1 and C1). As a result a voltage (Vout) proportional to the input frequency (Fin) will be available across the load resistor R4. I used 15V DC as the supply voltage (+Vs) while testing the circuit. The LM331 can be operated from anything between 5 to 30V DC. The value of R3 depends on the supply voltage and the equation is R3= (Vs â€“ 2V)/ (2mA). According to the equation, for Vs = 15V, R3=68K. The output voltage depends on the equation, Vout = ((R4)/(R5+R6))*R1C1*2.09V*Fin. POT R6 can be used for calibrating the circuit. Can we step down the 230V to 12V 50Hz using transformerless(X-Rated capacitor) stepdown circuit for measuring the voltage. Trying to calculate Vout, but are getting odd numbers. 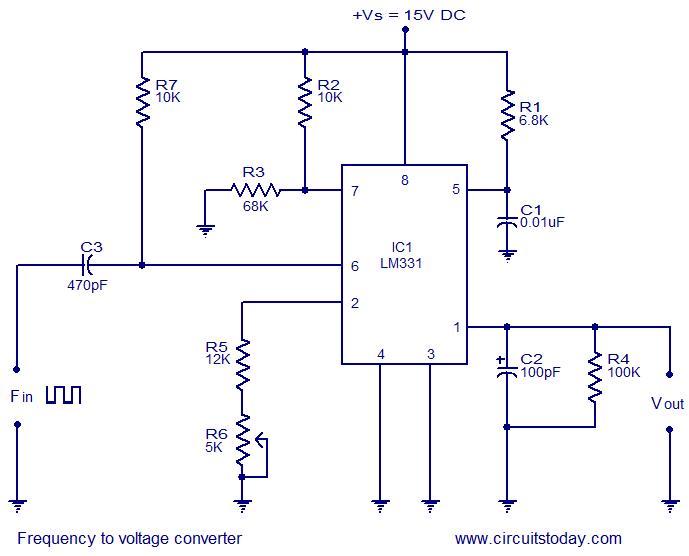 Can this circuit be utilized when the input frequency signal is a square wave? I’m not getting any results from the output at all with this circuit… any suggestions? i made the same circuit on proteus. but it is giving me constant 2.8v no matter how much i increase the frequency. Please help. Sorry, looks like this has already been covered. what is the range of input frequency that i cn give ti lm331? This IC is designed to operate between 0-1Hz Full Scale to 0-10KHz FS. You have to choose the components R1 C1 R4 R5 R6. Please refer Ti datasheet. Thanks for this circuit! You’re talking about the negative edge on pin6, in the explanation of the circuit. Does this mean that this circuit only function properly with square waves? hi.can u say me how this circuit work? sir I am chandu v v muralee gopi, i want the some concept in the Converters because to write the IEEE paper please help me sir. The equation R3= (Vs â€“ 2V)/ (2mA) I think it’s .2 mA , and what is V?? in this equation? what are the Min. & Max Fin and how many amps or watts? An other IC from National semiconductor used as a frequency to voltage converter is LM2907 (8 pins). My question is : Can I use the same circuit? if not, can you send me the best circuit to use for LM2907 ? Hi Paresh use the Fig2 of the Fairchild application data. i want the complete circuit diagram of the frequency to voltage converter wiht every component specification. please reply on the same if possible. data sheets together with the KA331 LM331 data sheet. What is the maximum frequency of this circuit? How can i make my my circuit more stable using a lm331 by producing a stale voltage for high frequencies. i need project topic for my final year project. Hi All the equation for R3 – R3= (Vs â€“ 2V)/ (2mA). is wrong, the denominator is 0.2mA as per national Semioconductors datasheet. R3= (Vs â€“ 2V)/ (0.2mA). ok true and what does the V stand for in the equation? it was very helpfull idea to use the same v-f as f-v i got wonderfull fast results …although it seems there is a mistake unintentionaly published or at least i didn’t get it well as the R3= (Vs â€“ 2V)/ (2mA) wish leads 15-2/2*10^-3 that’s equal to 6.5 K i thought we can use 6.8K and its nothing near 68K can you explain please? I checked circuit above and first question which came to my mind is: It is possible to calculate elements and construct a circuit on LM331 adjustable from low frequencies (50Hz) to highest (for example 40-50kHz)? Could you explain what part should be extended in this case or could you give me some tips for it ? Does national semiconductor still make IC LM331 ? secondly, Is it possible to send me a circuit that improves the power factor in alternating current?, Or the one that can be put in an energy aving plug? Allthough power factor correction circuits are achievable, the usage of them are pretty much illegal unless under license.